Home Opinion Jackson, So what about this flag? Jackson, So what about this flag? So what about this flag? If there is anything to the legend that on Mount Sinai God inscribed on a tablet instructions that his people should not worship idols or take graven images as substitutes, we can still argue about what that meant and why, and even argue about whether it is permissible to pose such questions. I take it as an assertion that there is but one god — call that supernatural person Eloim as the ancient Hebrews once did or Allah as the Arabic name recognized by Muslims, or Jah or Yaweh or Jehovah or so on — but the important thing is not to let some human being who deals in symbols substitute his or her imagery and beliefs for a divinely ordered nature of things. Believe it or don’t believe it, but it seems to this writer that the swap of shallow and manipulable symbolism for more profound truths was the gist of what was forbidden. Isn’t it also like that with a nation’s symbols? I’m a Panagringo, a US-Panamanian dual citizen. I know how so many Americans (in the narrow sense of the word) get about the US national symbols. For so many it’s about how not supporting corporate economic interests or foreign wars or torture or assassination is taken to be something like spitting on the flag. For folks like that freedom and democracy, rather than being real values that sometimes oppose one another, become a unitary and vacuous partisan slogan. You hardly ever convince people like that in an election campaign. Generally the best you can do is to defeat them. But what about the Panamanian tricolor, the same colors as Old Glory, but the symbol of an entirely different nation with a different culture, history and set of commonly held values? Did people die for the Panamanian flag on the Day of the Martyrs? 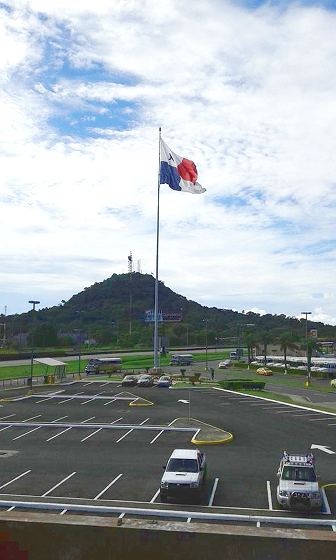 Did Panama become truly sovereign, an adult member of the family of nations, when they took down the American flag at the Panama Canal Administration Building for the last time, leaving Panama’s flag as the only one flying? People died during the events of January 1964 for various reasons, some just because they were unlucky enough to be in the wrong place at the wrong time. But notwithstanding a scuffle in front of a high school flagpole in which a flag was torn, it really wasn’t about that. It was about Panama being divided in two by a foreign enclave that included a lot of people who didn’t like Panamanians and who would sometimes go out of their way to be abusive. It was about a set of rules often enforced by people who harbored no ill will whatsoever, but rules that said that Panamanians were not particularly welcome on part of the isthmus. The flags were just symbols. The national grievances and popular aspirations were the real issues. Does the Panamanian flag flying alone at the Admin Building put a lump in the throat of every patriotic Panamanian? Don’t let that lump grow so large that it impairs your vision. The Panama Canal Authority plays all sorts of corny information control games, but neither those nor any sense of pride ought to obscure the reality that the canal — the nation’s principal public asset — is not well managed. Should Panamanians be terribly upset that the Ministry of Education published a graphic that had the Panamanian flag flying backwards? Probably no more upset than Zonians were about the Canal Zone stamp boasting of the new bridge over the canal, but with the bridge missing from the picture. Stuff happens, but if our public schools can’t get flag etiquette right, that’s the least of their troubles. We have a terrible school system, one of the worst in the world, and only some major wise investments and determined policy decisions will change that. Pay your respects to the flag when in Panama on this day, if you are a Panamanian as shorthand — but not a substitute for — respect for the country and people for which it stands. If you are a foreigner, show deference to the people among whom you live, including their symbols. Let’s keep it all real. Flag Day is about Panama and Panamanians, not an abstract three-color design on a piece of cloth.